Zaun boasts an unparalleled selection of security gates and other products to perfectly suit both your pedestrian and vehicle access needs. Whether you are looking for a complete fencing system or just new security gates to complement your existing fencing, we are sure you will find exactly what you are looking for in these pages. 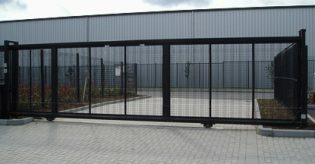 Consider whether you want sliding or swing security gates, barriers or bollards and an automated or manual solution. Some of these options may be decided for you based on the amount of room you have and the shape of your property and premises. You can also opt for the added security of access control with various forms of motorised and electronic options including gate timing systems for automated entry, keypad control, swipe card and proximity cards, gate remote controls and key switched. Whatever access or security gate solution you need, you can be sure that you will find it at Zaun.